After two weeks of uncertainty including two losses and various reports of locker-room tension, the Seahawks took a huge step forward to silencing their critics. Although it was incredibly frustrating and hard to watch, the Seahawks came away with a huge 13-9 win over the Carolina Panthers on Sunday. 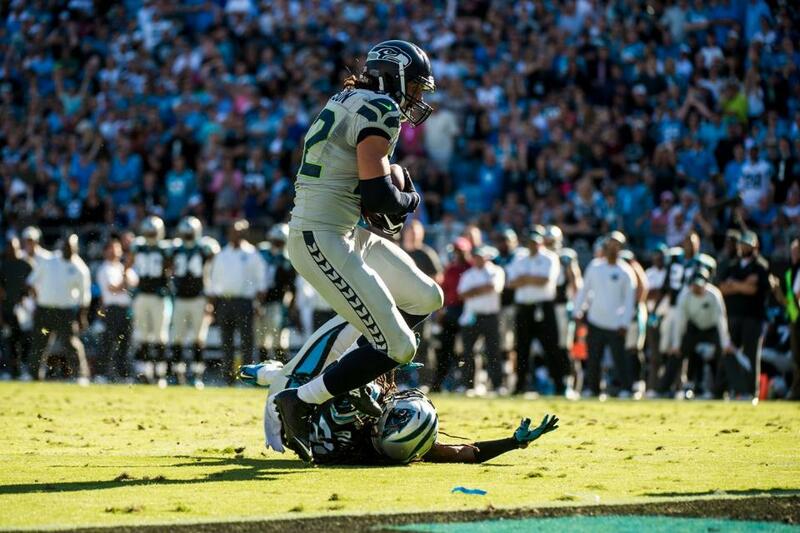 The Seahawks improve to 4-3 on the season while the Panthers fall to 3-4-1. Even though we were victorious there is still much to improve on moving forward. Here are my positive and negative thoughts I took away from this week’s game. YAC Makes Me Puke: Today the Seahawks had a serious problem tackling the ball carrier at the first point of contact. On several occasions throughout Sunday’s game the Panthers were able to break out of Seattle’s tackles and fight for extra yardage. Many of these plays set the Panthers up for manageable second down situations, leading to 17 total first downs. Carolina is equipped with several big, physical skill position players so it is not surprising that the Panthers do a good job in picking up yards after contact. What was frustrating however was that the Seattle defense did not have an answer for quarterback Cam Newton, running back Jonathan Stewart, and the rest of the Carolina offense as the game wore on. A common thing I saw in this game was that the Seahawks tried to wrap up Newton and Stewart above the waist, allowing them to shed tackles easier and for them to use their sneaky elusiveness to make plays and pick up extra yards. Fundamentals need to be tightened up in practice this week because these small plays have come back to bite the Seahawks historically. Thoughts on Russell Wilson: With the exception of a couple specific throws, it seemed like Seahawks quarterback Russell Wilson was out of sync with his receivers throughout Sunday’s game. Being known as one of the more accurate passers in the NFL, Wilson struggled to hit his receivers, often underthrowing them. There were a couple of short slant routes that were thrown in between two receivers and it is possible that miscommunication among the wide receivers may have been at fault. The Carolina defense did an excellent job of playing tight coverage and it was difficult for Wilson to find open receivers all game long. All in all, Wilson finished 20/32 for 199 yards, a touchdown, and an interception. I will give Wilson some credit though as he did a fantastic job leading the Seahawks down the field for the game-winning score, including a beautiful touchdown pass to tight end Luke Willson. That reception was proof that Wilson’s throws were improving as the game wore on. Once again the Seahawks offense played their best football at the end of the game. 9 Points That Should Have Been: There were two plays that should have been made which would have put 9 extra points on the board for the Seahawks. First was the fake read-option pass which worked with Ricardo Lockette in our week 1 win over Green Bay. Wilson showed run from the read-option formation and then threw in the direction of a wide open Cooper Helfet. The pass was underthrown however, and Helfet was unable to stop his route, come back, and make the catch. Upon further review it looked as though Wilson could not get a proper grip on the football because he had to make the throw before he crossed the line of scrimmage. 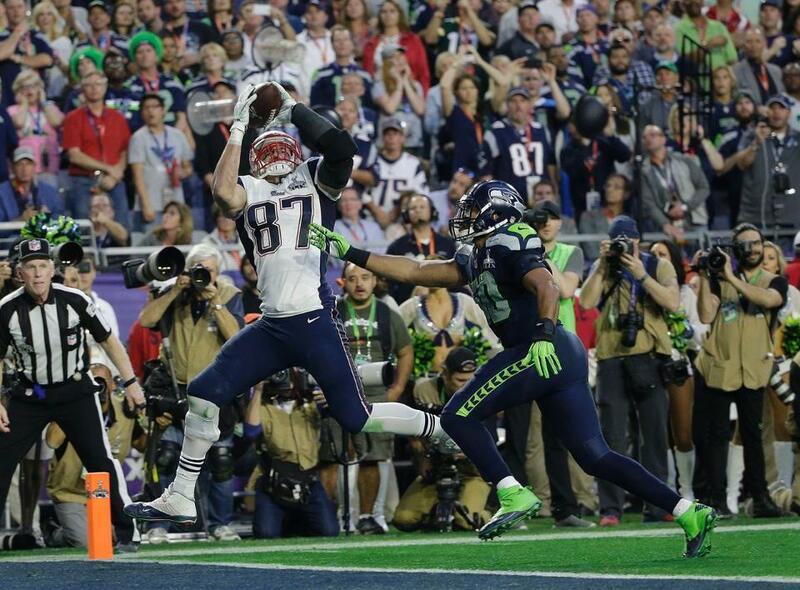 The pass came out of his hand funny and the ball was poorly underthrown. 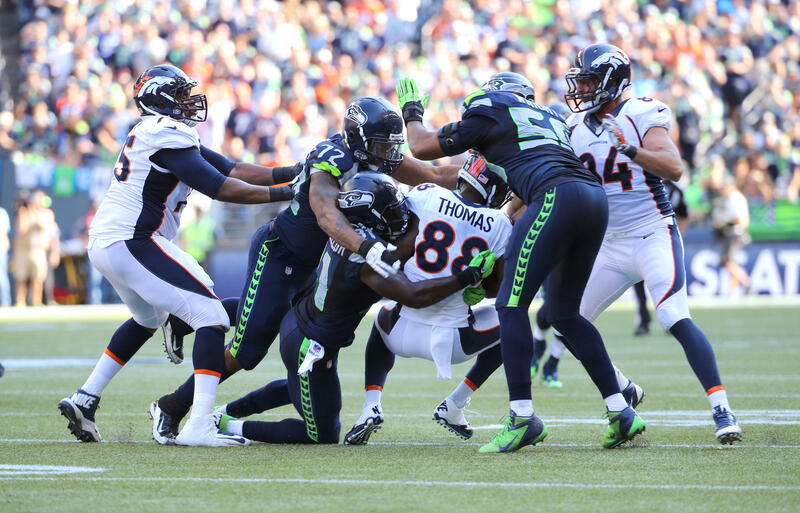 It would have been an easy touchdown but instead the Seahawks settled for a field goal which tied the game at 6-6. The second play came on first down from the Carolina 8-yard line late in the fourth quarter. Michael Bennett was able to penetrate the Panthers offensive line and he had Cam Newton dead in his tracks in the endzone which would have resulted in a safety and given Seattle an 8-6 lead. Instead, Newton was somehow able to shed Bennett’s sack and escape, leading to a throwaway. Although it did not result in a sack and two points, it was this play that set the Seahawks up for phenomenal defensive play on the Panthers next and last drive of the game. Irvin Prevents Potential Last Minute Magic: Lately it seems like all Bruce Irvin is useful for is racking up roughing the passer penalties and lining up offsides… multiple times… in the same game. 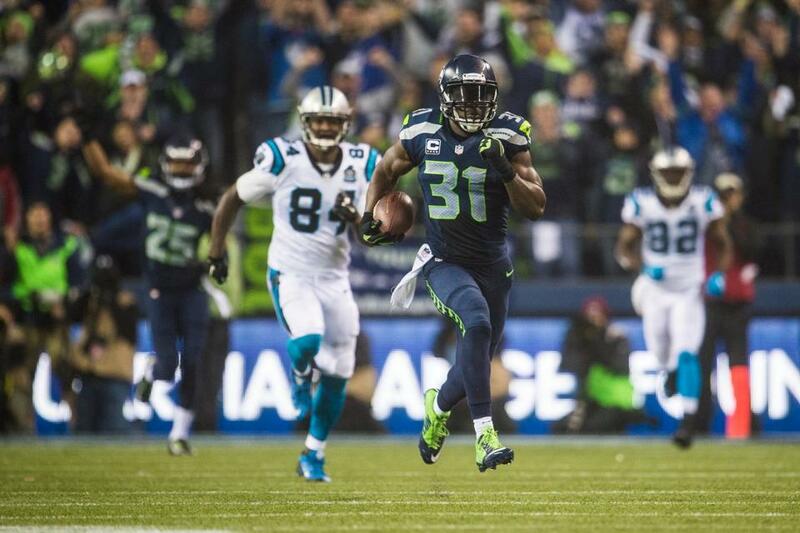 Today however, Irvin made two huge plays that preserved the Seahawks victory. The first was a sack of Cam Newton on the Panthers final drive of the game. A 2nd and 10 which turned into a 3rd and 18. Irvin thought that was so much fun that he went back for seconds on the very next play. In a moment where I have been begging Seahawks defensive coordinator Dan Quinn to dial up extra pressure late in the game, Irvin was successful in sacking Newton again, which set up an improbable 4th and 25. In games against Peyton Manning and Tony Romo earlier this season, Seattle has played relaxed defense late which cost us crucial late-game points. The decision by Quinn to send the house in addition to the play by Irvin made sure that the Carolina Panthers would not drive down the field to make this finish interesting, much like Denver and Dallas had respectively. Thoughts on Carolina: The Carolina Panthers defense played a very sound game this week. I think their defense can lead this team but the offense could cost them points and perhaps even wins. In a very weak division thus far, I believe the NFC South could come down to “which team does not screw up the most.” Right now the Panthers lead the division with a losing record. Their only competition for the division title will once again be the New Orleans Saints. Having said this, Cam Newton must improve under pressure. He played the final drive of this game, specifically the 4th and 25 play as if he knew the Panthers had already lost. If the quarterback play improves, the Panthers may be able to get into the playoffs as the NFC South champions. 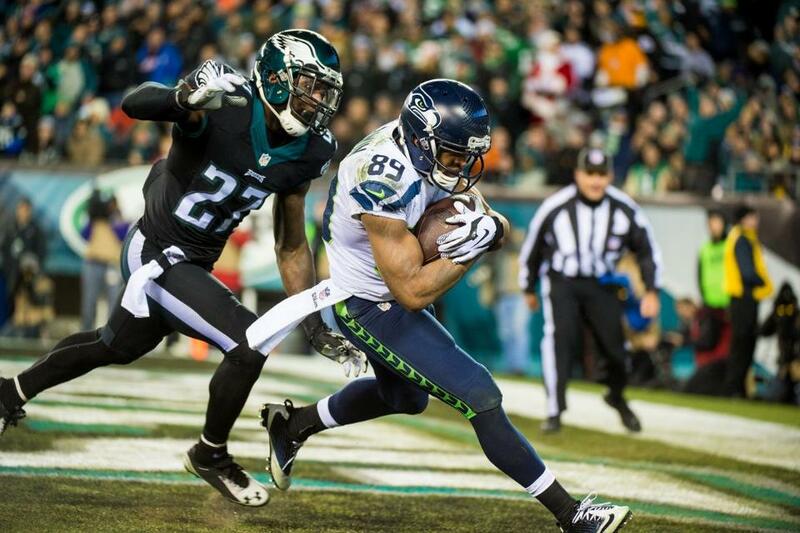 Random Thoughts: For the first time in 2014 the Seahawks wore their wolf grey jerseys and wolf grey pants. The looked slick as always but in my opinion they don’t look as cool when it is sunny. Nevertheless the Seahawks are now 4-0 all-time when wearing wolf grey… The Panthers wore their black jerseys and silver pants as expected… I think referee Walt Coleman called a pretty average game. Not a big fan of that guy… Dan Fouts is not a very good color commentator for CBS. Still better than a FOX broadcast with Chris Myers though… My Bellevue neighborhood lost power late Saturday night so I trekked to Seattle to watch the game, as I had no TV access on the eastside. That is a first… The Seahawks split the road trip. Too bad we couldn’t take both games and honestly if I knew we were going to split these two games I wish we would have beaten St. Louis and lost to Carolina… Now that our back-to-back road games are in the books it is time for back-to-back home games. In fact the Seahawks play 3 out of their next 4 games at home. 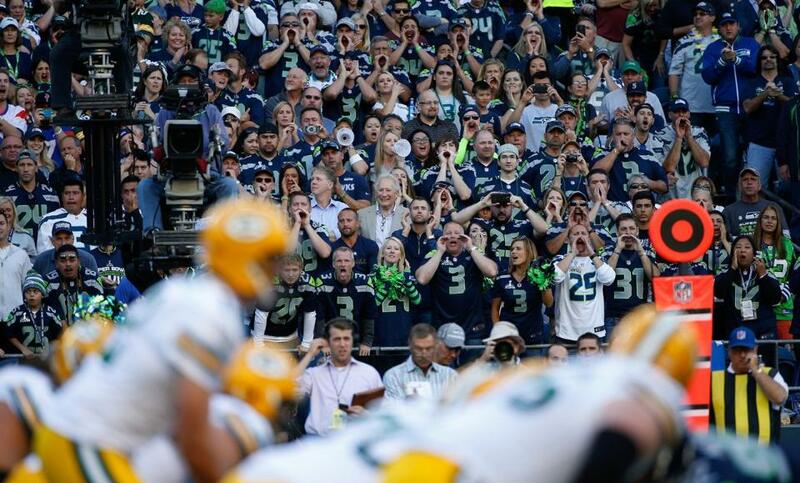 It is time to get some momentum going at CenturyLink Field and get back in the division race! Check back next Saturday as I preview the Seahawks week 9 matchup with the Oakland Raiders. Thanks for reading as always. Go Seahawks!